Today is the day everything changes. Today, you are chopping your hair off. You’ve made the decision. There’s no turning back. You’ve had glorious long hair for as long as you can remember, and you’ve finally worked up the courage to reinvent yourself with that fun short style you’ve been secretly obsessing over on Pinterest (or Bangstyle!). So you’re ready to make the big cut, now what? As liberating as the idea sounds, there’s actually a lot to consider before taking the plunge. First and foremost, why are you cutting your hair? A question any good stylist will ask their client that comes strutting in the salon requesting to chop off all their hair. If any part of the decision was motivated by a recent emotional crisis - like a breakup with that horrible excuse of a…..uh never mind, - then stop right there! While the independent and sassy short haired version of yourself seems like the perfect person to embody on this new start, cutting off your hair is a big change and needs to be something that you have mentally and emotionally braced yourself for. Impulsively making a drastic change to your appearance and self-identity when you’re already in a fragile state will likely not end well. We know several stylists that will straight-up send you back home. Trust us, it will only lead to more tears. Rational decision, check. Photo inspiration, check. 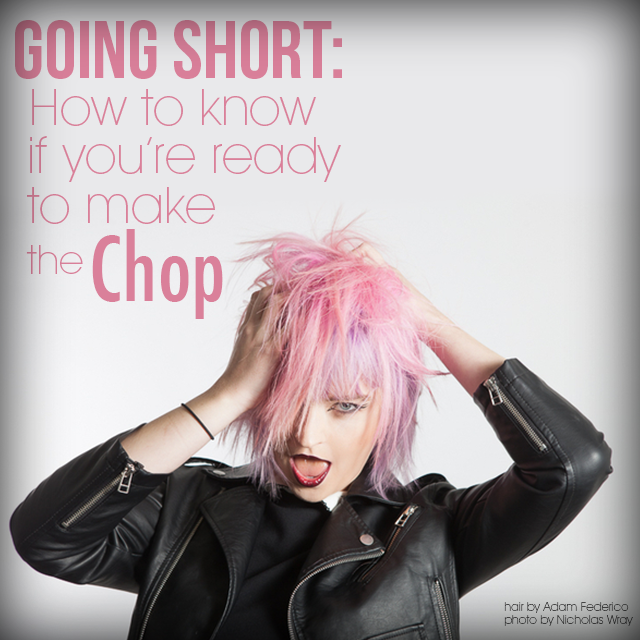 Lastly, you’ll need to get an understanding of what having short hair will actually entail. After a lifetime of luscious length, you’re going to need to adopt a completely new routine when it comes to your new shorter ‘do. Some short cuts can be harder to get away with not styling your hair before you leave the house, shorter styles require more frequent visits to the salon to maintain the length. You will likely need some new products too, some of which may be completely foreign to you. Get recommendations from your stylist and make sure they show you how to use anything you’re unfamiliar with, as well as walk you through exactly what you’ll need to do to upkeep your new chic style. Once you’ve got all that, tell your stylist to bring out the shears! Going short is an amazing feeling, and trust us, you will TURN HEADS in a way that only shorthaired confidence can.